They blend well with mineral and other wax types, and can be emulsified for coating and lubricating applications. Melting points range from about 20°C up to 70°C, and can be adjusted with careful blending and chemical or enzymatic modification to the glyceride structure. Stability to oxidation is increased by hydrogenation of the base vegetable oil or fat, and antioxidants can enhance this further if needed. The vegetable waxes may be blended with other wax types to optimize properties such as melting point, flexibility, viscosity and hardness. We can assist customers with the selection of suitable vegetable waxes according to their specific requirements. Today, with volatile market conditions and uncertain availability of mineral parrafins, many customers are turning to waxes based on vegetable oils as a cost-effective, natural and sustainable alternative. If you have questions on our products, would like to receive a sample, or would like to discuss a tailor-made blend, do not hesitate to contact us. Our waxes are based on renewable vegetable sources. They are non-toxic, biodegradable, free from genetically modified oils, and contain no animal-derived substances. Vegetable waxes offer a wide range of properties, with scope to customize blends for individual customer needs. 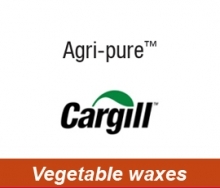 Vegetable waxes outperform mineral parrafins on a number of points, and can be modified and combined with other waxes to achieve optimum price and performance. Vegetable wax prices can be agreed for very long periods.